Sergipe is located in northeastern Brazil and is the country’s smallest state. State capital Aracaju was one of Brazil’s first planned cities and offers a relaxed and friendly atmosphere. The beautiful coastline with its 163 km offers several attractions including Mangue Seco, Xingó Canyon, Sāo Fransisco River and the historical towns Laranjeiras and Sāo Christovão. 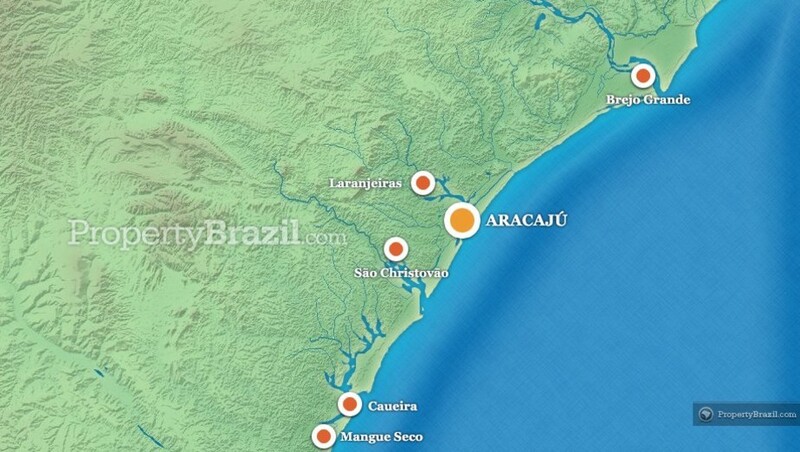 Aracaju is a pleasant town with a population of approx. 600 000 and offers a cozy and friendly atmosphere. The city was among the first planned cities in Brazil and as a result enjoys from a good infrastructure. Some of the most popular beaches in and around Aracaju include Praia Atalaia, Praia das Artistas, Praia Atalaia Nova, Praia Arauna, and Praia do Refúgio. Located 80 km south of Aracaju, Mangue Seco is an extremely beautiful and charming beach village surrounded by amazing nature and beaches. The village is located by the state border of Bahía and Sergipe and is actually part of Bahía, but as Salvador is 242 km away it is common to include Mangue Seco as one of the attractions of Sergipe as access is quicker and easier for tourists staying in Aracaju. Mangue Seco entered into tourist guidebooks when a famous Brazilian soap opera was filmed in the village. Access can only be made by boat, which gives Mangue Seco a rustic and incredibly charming atmosphere. The beautiful Sāo Fransisco River is one of the longest rivers in Brazil and there are boat tours available from Aracaju. Along the rout lies the stunning Xingó Canyon with its green waters and impressive beauty. Another highlight is the magnificent Foz de Sāo Fransisco where the river meets the Atlantic Ocean. At 23 km south from the state capital one finds historical town Sāo Christovāo. Founded in year 1590, it is Brazil’s fourth oldest city and today Sāo Christovāo is classified as a World Heritage Site. Attractions include a museum and beautiful historical churches. Laranjeiras is another great historical town in Sergipe where visitors can view beautiful colonial buildings and museums. Santa Maria Airport in Aracaju is the main airport in Sergipe. For more information about flying here, please visit the flight guide or join the discussion in the forum.